When asked to name a famous furniture designer we in the English speaking world might say “Chippendale”. 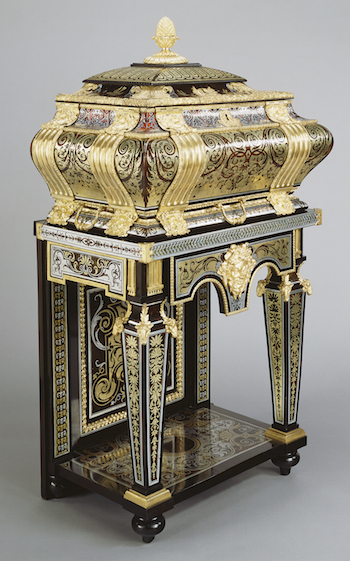 However, if you asked someone in France the same question, the answer might be “André-Charles Boulle”. André- Charles Boulle (1642- 1732) was the most celebrated ébeniste of his era. He did work for Louis XIV as well as many other aristocrats. He is best known for the decorative look that now bears his name (the Boulle-work or the Boulle technique). In its simplest form Boulle-work employs two sheets of contrasting veneers. They are laid on top of one another and a design glued to the surface. The design is then sawn out and the parts flip-flopped, with the light in the dark and the dark in the light. This way through one cutting two designs are produced. This all sounds good until you choose materials like Boulle did. He would use a metal (brass, pewter) for the lighted material and ebony or tortoiseshell for the darker. These are harder to saw and polish than using two softer woods. But, the results are more remarkable. In these two coffers at the Getty Museum in Los Angeles were made between 1684 and 1689. 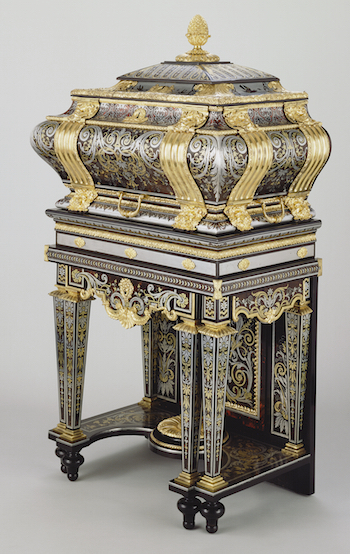 Boulle used three materials; brass, pewter, and tortoiseshell. (There was actually a third set of parts made in this case, but the third coffer is not part of the Getty collection). Note that he upper carcases share identical motifs, but the elements are inverted. If the mix of light and dark is roughly the same the resulting work will be equally elegant with each panel. I should give some size context to these coffers, as the scale isn’t obvious from the photos. They are about five feet high and three feet wide.